On the evening of September 24, 2013, a reception at Langham Hotel London attracted a large number of distinguished guests and there was a festive mood in the air. Accompanied by the national flags of China and Britain, the huge red background plate read sparkling golden words: “National Day, 1949-2013”. 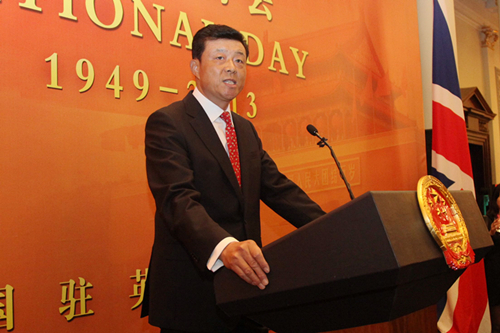 Ambassador Liu Xiaoming and his wife Madame Hu Pinghua were holding the 64th Anniversary of the Founding of the People's Republic of China. Nearly 500 guests attended the Reception, including British Secretary of State McLoughlin for Transport, Minister of State McNally for Justice, Air Chief Marshal Sir Peach, Vice Chief of the Defense Staff, former First Secretary of State Lord Mandelson, former FCO Minister of State Lord Howell, Lord Charles Powell, Chairman of the British government's Asia Task Force, British personages from all walks of life, foreign ambassadors and representatives from Chinese-invested institutions and overseas Chinese. At the Reception, Ambassador Liu made a passionate speech. He first summarised last year’s developments and future development of China with three praises: EPC, the Chinese dream and economic transformation. Ambassador Liu said that The 18th Party Congress (EPC) late last year effected a smooth transition of power, identified two important goals for China's development (by 2020, China's GDP and per capita income will double on the basis of the 2010 level; by the middle of this century, China will become a modernized socialist country that is rich, strong, democratic, culturally advanced and harmonious), and set out a five-in-one master plan for China's development in economic, political, social, cultural and environmental areas. It drew up a blueprint for China’s development. The Chinese Dream as initiated by President Xi Jinping is all about the Chinese people. It means all Chinese can pursue and enjoy a happy life. It also means all Chinese will grow and prosper as China grows and prospers. At the same time, the Chinese Dream is one that builds a world of harmony. That means a dream of peaceful development, a dream of win-win cooperation, and a dream of advancement of mankind. A China realising its Dream will bring more opportunities to the world and make a greater contribution to the mankind. China is currently in an important stage of economic transformation featuring quickened transforming of economic development mode. Currently, the fundamentals of the Chinese economy are intact: the overall performance is stable; at the same time China is committed to reform and innovation. Reform and innovation will unleash the potential of domestic demand which will deliver a new impetus to the economy; add to market dynamism and finally shift the economy from export-driven to domestic-led. Looking to the future. China has the conditions and capabilities to maintain long term, sustainable and healthy economic growth. China's development has a bright future. Quoting Premier Li Keqiang’s speech at the Summer Davos in Dalian, Ambassador Liu said now the new season of the Chinese economic miracle is unveiled. This is one of better quality and higher efficiency, and there are even more exciting stories to come. Ambassador Liu pointed out that the EPC, the Chinese dream and China's economic transformation are all of vital importance to China's development. 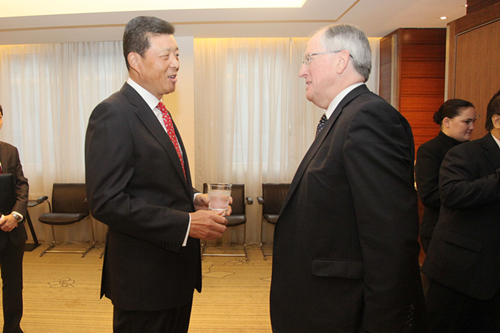 They have also provided positive energy to China-UK relations. Over the past year, China-UK relations returned to the normal track after going through some difficulties. Our cooperation in various fields advanced steadily. 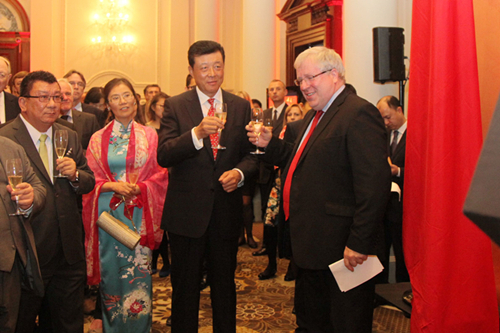 Chinese investments in Britain continued to grow fast. Since the beginning of last year, Chinese investments in Britain have totaled more than 12 billion US dollars. The two central banks signed a currency swap agreement worth 20 billion pounds. This is the first of its kind between China and major developed economies. Our cooperation in other fields such as education, science and technology and culture has also been charged with highlights. Ambassador Liu also told some touching stories of China-UK relations. In the city of Xi'an of Western China, a Briton named Tony Day started a charity programme called the Yellow River Soup Kitchen. He and Chinese volunteers give out food to people in need every week. Up to now Tony Day has been running this programme for eight years. In China Lei Feng is a household name for being always ready to help. Now Tony Day is renowned in China as the 'British Lei Feng'. In Tanzania Chinese and British engineers and workers are working closely together to build the gas pipeline that runs more than 500 kilometers from Mtwara to Dar es Salaam. When completed, this project will significantly speed up local economic growth. The other day, Ambassador Liu received a letter from a British traveller Ms. Kemi Oyemade, who had just returned from her first trip to China. She said that her experience in China was not how she had anticipated and certainly had no resemblance to how certain aspects of the Western media portrayed it. China was amazing and she was totally blown away by it. She is now learning Mandarin and will definitely be visiting China again. In conclusion, Ambassador Liu said he is confident that the progress of China-UK relations can be maintained if we abide by these principles: we must truly respect each other's core interests and main concerns; work together to enhance political mutual trust; and strengthen practical cooperation. If we follow these guidelines then China-UK relations will bear more fruits and write more touching stories. 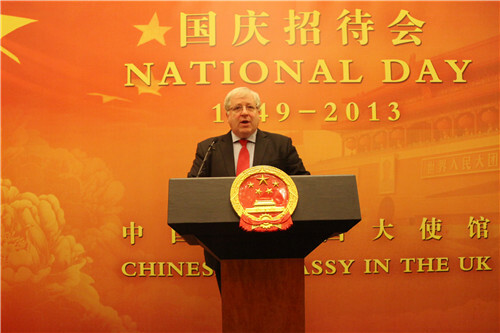 In his speech, British Secretary of State McLoughlin for Transport warmly congratulated on the 64thanniversary of the founding of China and spoke highly of China’s development achievements. He said that Britain appreciates China’s commitment to promoting balanced growth and realizing modernization, fully recognizes China’s positive role in the international arena and hads attached significant importance to developing relations with China. In recent years, steady progress has been made between the two countries in economic, trade, infrastructure and people-to-people cooperation with fruitful results. Britain has become China’s preferred investment destination in the EU, and both sides are making concerted efforts to realize the target of a bilateral trade volume exceeding USD 100 billion by 2015. He hoped that the two sides can further expand and deepen cooperation in various fields, and believed that UK-China relations will enjoy more opportunities and a broader prospect. Finally, McLoughlin sincerely wished China to make greater success which will be good not only for China and Britain, but also for the entire world. The guests acclaimed China’s development, saying that Ambassador Liu’s introduction to the EPC, the China dream and economic transformation has deepened their understanding of China’s goals and strengthened their confidence on China’s future development. They believed that the Chinese Government may bring the nation’s development direction under control and maintain a sustained and healthy economic development. All the guests held that the two countries should firmly take the current opportunity to further enhance understanding, strengthen mutual trust, deepen cooperation and lift China-UK relations to a new level. The touching stories told by Ambassador Liu resonated among the guests. One of them said he also had just made his first trip to China, finding that China is indeed a beautiful and lovely country which is quite different from the reports of western media. The overseas Chinese attending the Ceremony said Ambassador Liu’s remarks were most encouraging and inspiring. They hoped that the great motherland may enjoy evergrowing prosperity and the China dream may be realised at an earlier date. 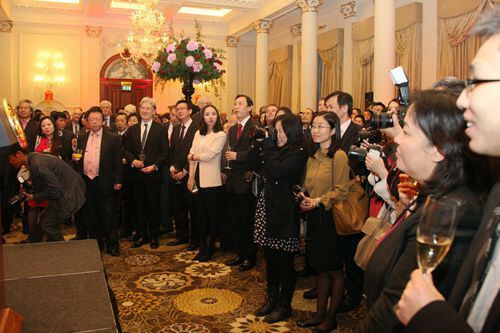 The overseas Chinese in Britain are willing to contribute to the motherland’s development and serve as bridges between China and Britain. At the reception, Ambassador Liu also received a joint interview by nearly 10 central media and local Chinese media like People’s Daily, Xinhua News Agency and European Times. Meanwhile, the Chinese Embassy also held a photo exhibition with the theme of “China’s Development and the Chinese Dream” at the hotel and played TV ads including Amazing China and the Wonderful Xinjiang which attracted attention from the guests.